Adventure Sports: When projecting a rocking image of your life on social media, nothing conveys “dynamic” more than pictures of oneself engaging in adventure sports. 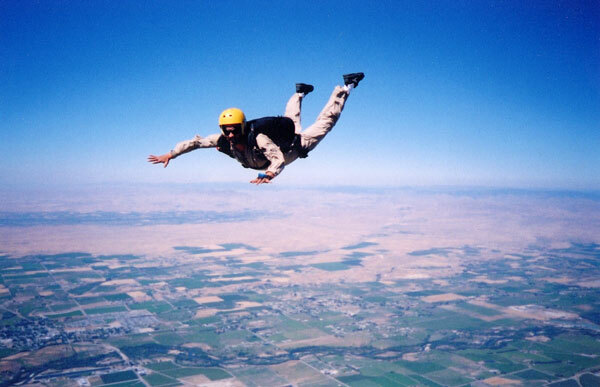 Which is why if any desi has skydived, you can be sure that’s his Facebook profile picture. It’s what social scientists call the “Zindagi Na Milegi Dobara” effect, a film that not only defined yuppie-cool as tomato-throwing, adventure sports, expensive bags and first-world problems of commitment and friendship, but also provided a generation a blue-print of what their life should be. Or more precisely, should appear to be to their friends and peers. Hence sky-diving. And white-water-rafting (the poor student’s skydiving), and bungee-jumping, rope-gliding, para-gliding and snorkeling. The lure of adventure sports is not difficult to understand. It gives the desi, and particularly those settled in the foreign, with their anodyne life of ABS and smoke alarms and trip to Patel Brothers at 5 pm on Saturdays and renter’s insurance a taste of danger that is controlled and regulated. Shouting “Wheeeeeee” as one propels through the air while securely tied to the chest of an expert, gives the desi a “living in the moment couldn’t care less for the future” edgy vibe that needs to be shared on Facebook for maximum enjoyment, while of course their 2030 retirement funds invested at Fidelity automatically adjust their share between stocks and bonds, because if it didn’t…well that would be risky. It often makes me wonder why my parent’s generation never did adventure sports. I guess they would have, but no one took pictures of them riding on a little edge of a step on a speeding mini-bus to-and-fro from work, hanging from the side with countless others, jostling and pushing, without a single safety harness. Fitness: While it is politically incorrect to flaunt your wealth egregiously (which is why some sleights of hand are required), it is perfectly fine to brag about how healthy, fit and fine you are. Which means not only endless status updates of the miles you have jogged (“Completed 5 K today in the morning”) or the reps you did (for some reason though, the desi is more into cardio than resistance) but also pictures. I will be honest dear friends. Your fitness pictures get to me. Yes they make me jealous which is me saying it served its purpose. Yeah yeah. I get it. No matter how hard I try (and trust me I have), I will never have your dynamism and metabolism. Food: A newbie mistake no desi worth his Instagram account makes is to post pictures of him/herself having food at a fast-food place like McDonalds or Burger King. This is a big step-up (or down depending on your point of view) from the days when every desi who has been in the firang lands would have a picture of themselves under the golden arches or standing next to a Ronald McDonald. But then those were innocent times when buying a Coke can was considered a luxury and people would keep an used Coke can on their living room coffee table, re-purposing it as a pen-stand because of course guests had to be discreetly informed you had a can of Coke. But a mistake some make is to still post pictures of themselves dining at TGI Fridays or Denny’s or any of the chain restaurants. I know because I have made it myself. You see my lovelies, any restaurant which has the word “chain” associated with it or has the words “endless”, “bottomless”, “unlimited” and “all you can eat” anywhere on the menu card does not qualify as fine dining of the kind that you should feel obligated to record on film. So no. Olive Garden isn’t the kind of cuisine the dudes of ZNMD would approve. Neither Red Lobster. The way I learned what fine dining was, and I recommend you do too, is to stalk the albums of your friends who have gotten their MBA from top 5 schools or work in the Valley. They always have pictures of themselves in fashionable roadside bistros, quaint coffee corners, delectable cake shops that serve a type of lemon meringue pie that cannot be found anywhere in San Francisco, German-style beer gardens, wineries and vineyards, and expensive fifty-dollar-a-plate steakhouses where the waiters have French accents Sometimes in order to show that there are still edgy, they may dine down in places referred to as “holes in the wall” but be rest assured those were reviewed by Zagat and made it to the top of Washington Post’s list of “Ten of DC’s Best Kept Secrets”. I watch these pictures and learn, sometimes controlling my urge to comment “Arre bhai babua peeyat raha mahua” when I see a friend whom I recall once drinking country liquor out of a repurposed Mother Dairy packet posting pictures of him and his wife sipping from long-stemmed wine glasses during their wine-trip through the French countryside. But then I realize that he would counter-comment on my food and baby pictures and hence I call a pre-emptive truce. Yes. I do baby pictures. And food pictures. Though not them together. Taking pictures of food prepared at home and putting them on social media is totally awesome. With food channels and Master Chef and cookery blogs and Instagram filters that make food look better than it tastes, great home-cooked food is the new Onida Color TV, neighbour’s envy and owner’s pride. Here is my dinner. Home-made humus, succulent Kifta kabab Moroccan style. Chicken Cassiatore. Home-rolled sushi. What’s yours? Oh you didn’t take a picture. Ok I think I know what you are having. Food getting cold? I don’t care. Let me take another picture before that fine patina of moisture on the chicken dries away. Mmm…let’s see. Camera at plate level. Yesss. That makes it look more succulent. Let’s see the pictures. Oh no no. This one of the Swedish meatballs cooked country-style didnt come out well, it looks like deer droppings after a rainy day. Delete delete. You know what? I think we should get plates a different shade of light blue, this one kind of swamps out the color palette of the food, don’t you think? Well maybe next time. Let’s eat now. Wait. I forgot the salt and seasoning in this. Damn. Oh well, who cares? There’s already 42 Likes. Restaurant-pictures and home-cooked pictures are in many ways complementary. While the former convey affluence and an appreciation of the finer things in life, the latter provide an aura of fulfilling domesticity, good taste, and the ability to be hands-on. Pro tip: Use a judicious mixture of both to create the impression of perfectness. Pro pro tip: If you are going to heat pre-cooked packaged dinners (e.g. Deep Shahi Paneer) and pass it off as your cooking, remember to transfer the food out of the plastic container onto a glass plate before clicking the picture. I am superior too all. I don’t post pictures on FB. Funny. Do post about the lovey dovey husband-wife messages. Wait! It’s the American couples who do that. So irritating. “You guys live under the same roof for god’s sake. Talk to each other and leave us out!” is what I mean to comment, but never do. While all of these are predictable (for someone who has been fed on stories like these and barely crossed India)…what would be interesting is to cover some nuggets which have not been flogged at all. Now that coupled with your flair for writing should be a treat. Masterful indeed. And of course, guilty as charged. Make sure you live up to the “to be continued” bit. Thanks a million for the pro pro tip. I love reading your articles. Being an undergrad yet, I hope by being privy to your lens not to commit these gaffes. I am by no mean fit enough for anything 😛 . Oooo…the “Fitness” photos and status updates really sting, don’t they? And it is a good thing if they do since among all the show-off topics, good health seems more or less justified. Especially if it happens to encourage others to exercise and eat better. Damn you Greatbong! You just took away the pleasure of being on social media. Now don’t mention the word ‘travel’ on the next part and finish it off entirely for my ilk!!! Your acquaintances seem to be leading a fairly pedestrian existence. I don’t see anything about summer homes in the hamptons or $10000 designer puppies. Maybe you’ll address that later. I don’t know if you plan to address the clothes desis proudly wear in their photos, which are almost always last season’s fashion picked up for cheap from an outlet mall. Desperately lonely….thats what we are. Sharing photoshopped feelings and pictures on facebook is not going to take that away. Its a vicious cycle and just aggravates the lonliness. Selling our true selves for ‘likes’, when what we need is love !!! I havent checked my facebook account (created by me better half) in 7 years now. To most of these folks – its harmless fun. Which, truth be told, is pretty true. Tried to wrap a python around my neck to get over my fear of reptiles… just couldnt! You could explore this theme as well – your pet dog/pet cat/pet parrot is the ace of spades to getting a few ‘likes’ and also expose the caring nurturing side of you. Your friends are awfully shallow types. P.S. my dad did scuba diving (among other more ‘dangerous’ sports) and he was born in 1940s, right before independence. But then he was exceptional man. The way I look at it is that it is free entertainment, with the full range of human foibles and vanities on display, especially when you knew the people in their “downmarket” days back in the day. In a sociological sense, it is a measure of how far formerly ordinary middle class Indians have come in terms of their purchasing power and options in life (- that goes for you too, GB!). The only difference is that some want the whole world to know, and movies like ZNMD have given them the Bollywood seal of approval. I felt the urge to put up a few of these pictures on FB when I splurged on a luxury cruise last month, blowing out a chunk of money from weeks of unused vacation time during a job move. But then remembered all my friends and relatives who have not “made” it and don’t have that option, and realizing I don’t really care for the approval of the kinds of people who would “Like” these, apart from immediate family. For someone as astute as you, I was hoping to see references to DSLR photos of a solitary seagull on a shipwreck in an obscure Greek island to be on this list. Hope I see it in part 3 at least :-). Would any sane person give 5-7 lakhs for fotos if FB did not existed ??? And you believe things posted on ToI-let paper? Well – good luck to you I guess. Either you don’t read the newspaper or you have misplaced convictions that local newspapers would merely lift content and replace dollars with rupees. Either you don’t have the habit of reading newspapers or you are completely out of touch with reality. 7-8 lakhs for photography of all wedding events happens even within Indian cities. I would urge you to value more than merely believing that Indian journalists would lift content from international papers and replace dollars with rupees. Hits the nail right on the head. Folks need to take a cue from this!